In order to help understand the significance of the subtle differences in production methods used by individual producers in Champagne to make their champagnes stand out from the crowd it is first necessary to recap quickly the basic way in which Champagne is made, what the Méthode Champenoise comprises. In Champagne the grapes are all picked by hand, mechanical harvesting is not allowed because it is important not to break the skins before pressing. Whole bunches of grapes are collected in small crates to avoid crushing and delivered quickly to the press house. The grapes are then pressed as gently and as fast as possible, typically still in the traditional coquard basket press although many producers now use pneumatic presses. The juices from the 4,000kg of grapes that makes up the ‘marc’ in a standard size press are then separated as they run off with the cuvée, the clearer free run juice produced at the start of pressing, kept separate from the darker ‘taille’ which contains more impurities as a result of the greater pressure gradually exerted in the press. The amount of juice that may be drawn off in the cuvée or first pressing and the taille is strictly regulated (20.5Hl and 5Hl). Before the first alcoholic fermentation takes place impurities in the pressed grape juice are removed by débourbage, a processing of settling that allows solid particles to sink to the bottom of the vat, enabling clear juice to be drawn off at the top. This filtration process may be encouraged by chilling the juice in the vat. The clear juice then goes through alcoholic fermentation, most often in large stainless steel vats, although a few famous houses and an increasing band of smaller producers ferment the wines wholly or partially in oak barrels or casks of varying sizes. At the end of this pressing and initial fermentation process, which starts from outset of the grape harvest typically in mid-September, the producer will have a collection of still wines, perhaps more than 200 in the case of some of the larger houses, from which they will make their blends for all the different cuvées they produce in any given year (see blending above). Once a blend is complete, and typically this will be a process that takes place between the end of the harvest and the following spring, over a period of several months during which individual batches of wine will be repeatedly tasted and assessed by the winemaker, it is put in a bottle, the liqueur de tirage (a solution of wine, yeast and sugar) is added and the bottles lain on their side in a cool cellar. The secondary fermentation – which creates the bubbles as sugar is turned into alcohol giving off carbon dioxide — now takes place slowly in the bottle. The wine will then be left to age on its lees for a minimum of 15 months, in the case of non-vintage, or three years for vintage Champagne. 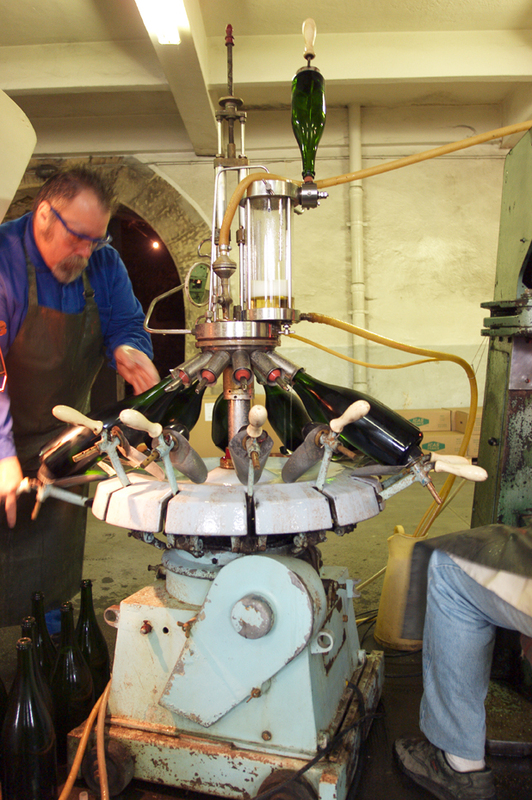 The last stage in the process is remuage or riddling, the method of removing the yeast deposits left in the bottle. To do this bottles are twisted, shaken and turned, traditionally by hand but now mostly in a computer programmed gyropalette machine, eventually finishing in a vertical position neck down with the yeast deposit settled on the crown cap or cork closure. Finally the neck of the bottle is frozen; the cap or cork removed and under the pressure which has built up during the fermentation process a pellet of semi-frozen liquid containing the yeast deposit shoots out. 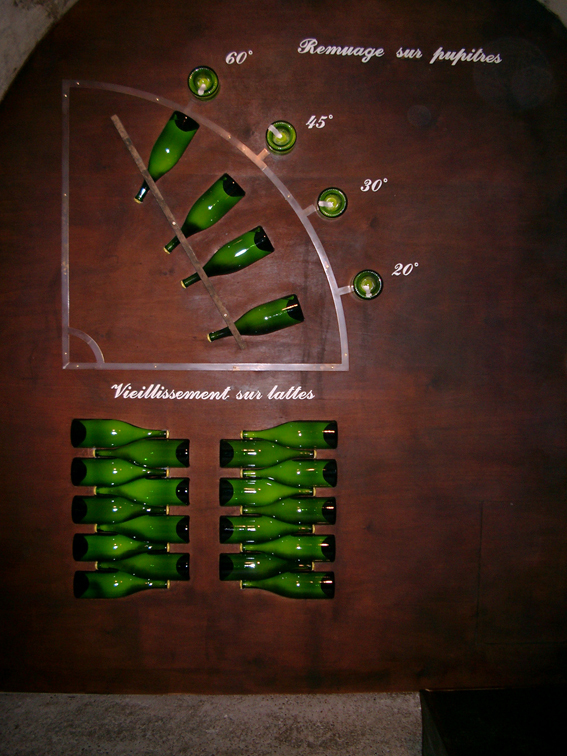 After this dégorgement process as it is called, the bottle is topped up and the liqueur de dosage is added, the amount of sugar varying depending on the style of Champagne being made (see box on dosage/sweetness levels in Champagne). The wine is then returned to the cellar to rest and allow the dosage to marry, ideally for several months, and it is then ready to go on sale.